Let’s talk about fashion today. 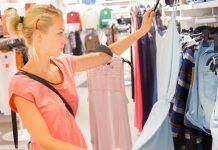 We can’t deny the fact that it’s super fun to follow new trends and splurge all our money on clothes and fashion accessories. But, at some point of time, we had a nightmare of going all broke. Isn’t it? Want some cool fashion ideas without burning a hole in your pocket? Don’t worry because we have got the prefect DIY fashion hacks that are unique, budget friendly and simple for all you girlies to try. All you need is to have some creative skills and voila! You’re ready to go. Fringing a top is super fun and looks super funky. It is an ideal outfit for summer days and a day out brunch with your friends. 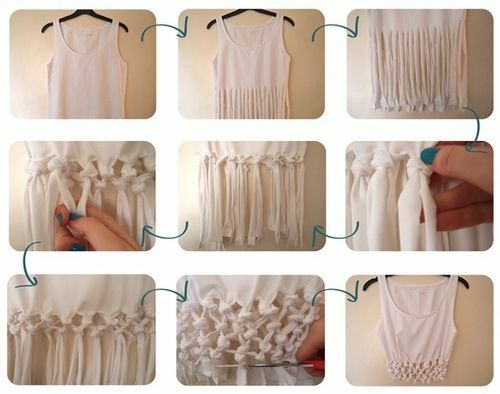 You can have that perfect fringe top from t-shirts you have already have in your wardrobe. (i) Lay down the shirt on floor or any plane surface and draw a line with the help of a pencil on your shirt from where you want the fringe to start. (ii) Now, cut both the sleeves and the neckline to give it a perfect tank look and lastly trim the entire hem of the shirt from the bottom. (iii) Measure across and decide how wide you want your fringe. I personally believe, ¼ inch wide is perfect. Keep in mind that every measurement of fringe needs to be equal. (iv) Cut the strips carefully right up to the line you drew and tug each strand down to get a natural look. (vi) Repeat the fifth step with every single strand by pairing them up with the adjacent strands. Now criss cross the strands in different repeated patterns and continue knotting more rows. (vii) When you’re done reaching the end, you may just trim the excess strands to give it a neat look. Summer is down the lane and nothing can be better than a pair of shorts to give you that perfect summer look. From this particular DIY, we want to show you how easy it is to transform your old jeans into a pair of pretty shorts. (i) Try your jeans and mark where you want the desired cut and cut off bottom of the jeans. (ii) Turn the shorts inside and out and iron it. (iii) Fray the hem by tugging it to give a distressed look. Now wash the shorts just to get that perfect distressed denim shorts. Who doesn’t love colors? Add a dash of color this season with this simple DIY colored bauble necklace. It looks super chic and trendy. So, be ready to make a style statement with this DIY. Thin chain or leather chain to fit enough your head. (i) Paint your wooden beads with your favorite color. I personally love golden and silver as they both goes with every outfit. Let the color dry. (ii) Take the chain and string the beads along with the chain. Keep in mind that if you’re using a leather chain, don’t forget to make a knot at the end. (iii) And you’re ready to wear it as a necklace. It will go perfectly with a plain white top for a minimal look. Yeah, you read it right. You can even turn your t-shirts into cute totes. Totes are in fashion now and it gives such a sturdy and classy look, one cannot ignore. Its super fun and super easy to give a makeover to that t-shirt. (i) Lay your t-shirt on a flat surface and cut the sleeves, neck band and the bottom seam. (ii) Now repeat the steps that we followed while making a fringed top previously. (iii) Pull each fringe down to give it a neat look. (iv) Now, tie the left shoulder with the right one and it’s ready. Sneakers are making a trendsetter for every fashionista. It gives a sporty yet chic look to your overall appearance. Bored of your old sneakers? Revamp your old sneakers into a pop of colorful makeover. It’s a one must DIY for winters to keep you warm. (i) Take out the laces from the both the shoes. (ii) And then, splash colors of your choice. You can do heart shapes, different patterns and geometric shape for a sturdy look. Tinted lip balms are a great alternative for the ones who don’t wear lipsticks. Tinted lip balms are glossier than that of a lipstick and its natural ingredients don’t leave your lips chapped. So we have got a really good DIY which can give you that perfect dash of color just like a lipstick does. 1 tablespoon of shea butter. 1 teaspoon of pomegranate juice. (i) Melt down the beeswax, coconut oil and shea butter all together in a small container. Remember not to add water. (ii) When melted, carefully stir all the ingredients and add the pomegranate juice. (iii) Add few drops of peppermint oil as it give a fine fragrance from balm. (iv) Once everything is melted and mixed properly, transfer this mixture into a small discarded (lip balm) container. Pomegranate is enriched with antioxidants and will help remove pigmentation from your lips. So, these were some really easy and fun to do DIY. So, if you ever think of discarding your old clothes and fashion accessories, do try these easy peasy DIYs to make those wearable again. Revamp your old fashion accessories into new sturdy ones. Do give it a shot and let us know which one is your favorite. Previous article13 Immune Boosting Foods You Must Know!